James Samuel Pilafian (October 25, 1949 in Miami, FL – April 5, 2019 in Tempe, AZ)  was an American tuba player. Miami, officially the City of Miami, is the cultural, economic and financial center of South Florida. 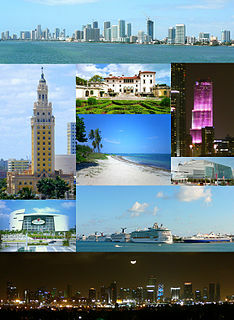 Miami is the seat of Miami-Dade County, the most populous county in Florida. The city covers an area of about 56.6 square miles (147 km2), between the Everglades to the west and Biscayne Bay on the east; with a 2017 estimated population of 463,347, Miami is the sixth most densely populated major city in the United States. The Miami metropolitan area is home to 6.1 million people and the seventh-largest metropolitan area in the nation. Miami's metro area is the second-most populous metropolis in the southeastern United States and fourth-largest urban area in the U.S. Miami has the third tallest skyline in the United States with over 300 high-rises, 80 of which stand taller than 400 feet. Tempe, also known as Hayden's Ferry during the territorial times of Arizona, is a city in Maricopa County, Arizona, United States, with the Census Bureau reporting a 2017 population of 185,038. The city is named after the Vale of Tempe in Greece. Tempe is located in the East Valley section of metropolitan Phoenix; it is bordered by Phoenix and Guadalupe on the west, Scottsdale and the Salt River Pima–Maricopa Indian Community on the north, Chandler on the south, and Mesa on the east. Tempe is also the location of the main campus of Arizona State University. Piliafian participated in the National Music Camp in Interlochen, MI and was the second tuba player to win the concerto competition. Via his performance at Interlochen, he was awarded scholarships to study at both Dartmouth College and the Tanglewood Music Center. Leonard Bernstein chose Pilafian to perform in the world premier of Bernstein's Mass at the opening of the John F. Kennedy Center for the Performing Arts. Interlochen is an unincorporated village in Northwest Lower Michigan. It is in Green Lake Township, within Grand Traverse County. The community is noted for the internationally renowned Interlochen Center for the Arts. As of the 2010 census, the Interlochen census-designated place (CDP) had a population of 583. Dartmouth College is a private Ivy League research university in Hanover, New Hampshire, United States. Established in 1769 by Eleazar Wheelock, it is the ninth-oldest institution of higher education in the United States and one of the nine colonial colleges chartered before the American Revolution. 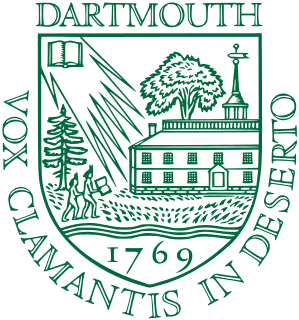 Although founded as a school to educate Native Americans in Christian theology and the English way of life, Dartmouth primarily trained Congregationalist ministers throughout its early history. The university gradually secularized, and by the turn of the 20th century it had risen from relative obscurity into national prominence as one of the top centers of higher education. The Tanglewood Music Center is an annual summer music academy in Lenox, Massachusetts, United States, in which emerging professional musicians participate in performances, master classes and workshops. The Center operates as a part of the Tanglewood Music Festival, an outdoor concert series and the summer home of the Boston Symphony Orchestra (BSO). Since then, Pilafian performed numerous times in international concerts and recordings. He founded the Empire Brass Quartet and performed in the Broadway Musicals Doctor Jazz and Much Ado About Nothing. Pilafian was also active in the jazz scene, having played with the Duke Ellington Orchestra and, since 1991, in the duo Travelin' Light with guitarist Frank Vignola. With the saxophonist Scott Zimmer, Pilafian also played the music of Maurice Ravel, Béla Bartók, Thelonious Monk, Ornette Coleman, and Captain Beefheart. Pilafian also participated in a Pink Floyd recording. Frank Vignola is an American jazz guitarist. He has played in the genres of swing, fusion, gypsy jazz, classical, and pop. Joseph Maurice Ravel was a French composer, pianist and conductor. He is often associated with impressionism along with his elder contemporary Claude Debussy, although both composers rejected the term. In the 1920s and 1930s Ravel was internationally regarded as France's greatest living composer. Béla Viktor János Bartók was a Hungarian composer, pianist, and ethnomusicologist. He is considered one of the most important composers of the 20th century; he and Franz Liszt are regarded as Hungary's greatest composers. Through his collection and analytical study of folk music, he was one of the founders of comparative musicology, which later became ethnomusicology. Pilafian started teaching at Arizona State University in 1994 and later at North Dakota State University in 2017. 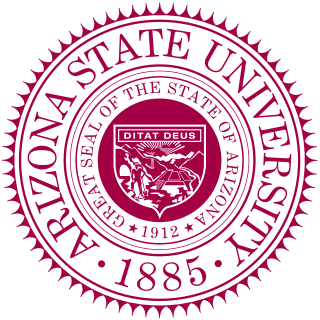 Arizona State University is a public metropolitan research university on five campuses across the Phoenix metropolitan area, and four regional learning centers throughout Arizona. North Dakota State University of Agriculture and Applied Sciences, more commonly known as North Dakota State University (NDSU), is a public research university in Fargo, North Dakota. The institution was founded as North Dakota Agricultural College in 1890 as the research land-grant institution for the state of North Dakota. NDSU is a comprehensive doctoral research university with programs involved in very high research activity. NDSU offers 102 undergraduate majors, 170 undergraduate degree programs, 6 undergraduate certificate programs, 79 undergraduate minors, 81 master’s degree programs, 47 doctoral degree programs of study and 10 graduate certificate programs. There were 14,358 students attending NDSU from 47 different states and 79 different countries as of Fall 2017. Leonard Bernstein was an American composer, conductor, author, music lecturer, and pianist. He was among the first conductors born and educated in the US to receive worldwide acclaim. According to music critic Donal Henahan, he was "one of the most prodigiously talented and successful musicians in American history." Samuel Carthorne Rivers was an American jazz musician and composer. He performed on soprano and tenor saxophones, bass clarinet, flute, harmonica and piano. Michael Kevin Daugherty is an American composer, pianist, and teacher. He is influenced by popular culture, Romanticism, and Postmodernism, and is one of the most widely performed American concert music composers of his generation. Daugherty's notable works include his Superman comic book-inspired Metropolis Symphony for Orchestra (1988–93), Dead Elvis for Solo Bassoon and Chamber Ensemble (1993), Jackie O (1997), Niagara Falls for Symphonic Band (1997), UFO for Solo Percussion and Orchestra (1999) and for Symphonic Band (2000), Bells for Stokowski from Philadelphia Stories for Orchestra (2001) and for Symphonic Band (2002), Fire and Blood for Solo Violin and Orchestra (2003) inspired by Diego Rivera and Frida Kahlo, Time Machine for Three Conductors and Orchestra (2003), Ghost Ranch for Orchestra (2005), Deus ex Machina for Piano and Orchestra (2007), Labyrinth of Love for Soprano and Chamber Winds (2012), American Gothic for Orchestra (2013), and Tales of Hemingway for Cello and Orchestra (2015). Daugherty has been described by The Times (London) as "a master icon maker" with a "maverick imagination, fearless structural sense and meticulous ear." Frederick Fennell was an internationally recognized conductor, and one of the primary figures in promoting the Eastman Wind Ensemble as a performing group. He was also influential as a band pedagogue, and greatly affected the field of music education in the USA and abroad. In Fennell's New York Times obituary, colleague Jerry F. Junkin was quoted as saying "He was arguably the most famous band conductor since John Philip Sousa." Judy Kaye is an American singer and actress. She has appeared in stage musicals, plays, and operas. Kaye has been in long runs on Broadway in the musicals The Phantom of the Opera, Ragtime, Mamma Mia!, and Nice Work If You Can Get It. The Harvard University Band (HUB) is the official student band of Harvard University. The Harvard Wind Ensemble, the Harvard Summer Pops Band, and the Harvard Jazz Bands also fall under the umbrella organization of HUB. Currently, the band plays for all football games as well as home men's and women's ice hockey games. Occasionally it plays at men's and women's basketball games. The uniform for both football games and other formal appearances consists of a crimson wool HUB blazer worn over a white shirt with a black HUB logo tie, black pants, and black shoes. In the early days of the Band, white sailor hats and khaki pants were worn. For hockey games, the band wears a custom Harvard Band hockey jersey, modeled after the home jerseys for men's hockey, which features images of Bertha on the sleeves. Band alumni, known as crusties, maintain strong ties to the HUB, sometimes continuing to act as regular members well after graduating from the University. Illegitimum non carborundum (INC) is the HUB motto. Written correspondence from HUB or HUB members is frequently signed with INC.
Velvet Brown is professor of tuba and euphonium at Pennsylvania State University. Prior to joining the faculty at Penn State in 2003, she taught at Bowling Green State University (Ohio), Ball State University (Indiana), and served as an associate director of University Bands at Boston University. Ms. Brown is currently a member of the ITEA Board of Directors and has served as the secretary of the Executive Committee for the International Tuba and Euphonium Association (2001–2007). She is also a founding board member of the International Women’s Brass Conference. Ms. Brown is noted for receiving the 1999-2000 William Fulbright Fellowship Vinciguerra Award. She has had many successful students who have won prestigious playing and teaching positions as well as prizewinners at various regional, national and international competitions. Rebecca Luker is an American actress, singer and recording artist who has appeared in several musical theatre productions on Broadway. Luker's voice type is soprano. The New York Times has compared her to actresses such as Barbara Cook and Julie Andrews. She has been nominated for three Tony Awards and two Drama Desk Awards, and she is featured on opera star Plácido Domingo's recording, The Broadway I Love (1991). Rex Martin is one of the world's virtuoso tuba players, appearing on over 70 symphony orchestra recordings. He primarily studied under Edward Livingston and Arnold Jacobs, though he also took lessons with Edward Kleinhammer. John William Barber, known as Bill Barber or Billy Barber, is considered by many to be the first person to play tuba in modern jazz. He is best known for his work with Miles Davis on albums such as Birth of the Cool, Sketches of Spain and Miles Ahead. Jeanne Baxtresser is an American flutist and teacher. She is most notable for her position as principal flutist of the New York Philharmonic for over 15 years, as an author, and as a professor and master teacher. Previous positions include professor of flute at the Juilliard School, Manhattan School of Music, New England Conservatory and Carnegie Mellon University. She received the National Flute Association's Lifetime Achievement Award in 2006. She has been credited with "upholding an increasingly higher standard of artistic excellence for the flute." 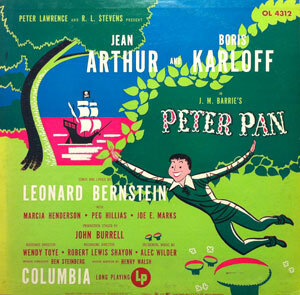 Peter Pan is a 1950 musical adaptation of J. M. Barrie's play Peter Pan, or The Boy Who Wouldn't Grow Up with music and lyrics by Leonard Bernstein; it opened on Broadway on April 24, 1950. This version starred Jean Arthur as Peter Pan, Boris Karloff in the dual roles of George Darling and Captain Hook, and Marcia Henderson as Wendy. The show was orchestrated by Hershy Kay and conducted by Benjamin Steinberg. The show ran for 321 performances, closing on January 27, 1951. "Chinatown, My Chinatown" is a popular song written by William Jerome (w.) and Jean Schwartz (m.) in 1906 and later interpolated into the musical Up and Down Broadway (1910). Charles Earl "Charley" Wilkinson III is an American professional musician. He has been a member of the National Symphony Orchestra in Washington D.C. since 1979, where he currently performs as the assistant principal timpanist, and is a key part of the percussion section. He attended the Interlochen Arts Academy, earned his B.A. at the Cleveland Institute of Music in 1977, and his M.A. in 1978. He was also appointed associate adjunct professor of percussion at Kent State University in 1978, until his departure in 1979. Joshua Rosenblum is an American composer, conductor, pianist, arranger, and music journalist. He has composed extensively for the concert hall as well as for musical theatre, and currently teaches Composing for Musical Theater at Yale University, his alma mater. As a pianist, he performs frequently in the New York City area as soloist and accompanist, as well as in Broadway pit orchestras, and with the New York City Center Encores! Orchestra. He has conducted numerous Broadway and Off-Broadway shows, including How the Grinch Stole Christmas!, Wonderful Town, Falsettos, Miss Saigon, and Anything Goes. Duilio Dobrin, is an American conductor and pianist of Argentine origin. As conductor for the Interlochen Arts Academy OrchestraDobrin earned high praise for his stellar performances, ranked as among the very best in its history. On 1 May 2013, he won the 2013 Downbeat Award for best classical performance. David Hattner is an American professional clarinetist and conductor currently serving as music director of the Portland Youth Philharmonic. Raised in Toledo, Ohio, Hattner attended the Interlochen Arts Camp and Arts Academy, experiences which inspired him to become a professional musician and conductor. He graduated from the Arts Academy in 1986 and enrolled in Northwestern University where he studied clarinet performance under Robert Marcellus. In 1988 he placed second in the International Clarinet Association's Young Artist Competition and was selected to join the American-Soviet Youth Orchestra. He earned a music degree with honors in 1990. Daniel William McCarthy is an American composer, author, conductor, professor, and black belt martial artist. He has been Professor and Chair of Music Composition and Theory Studies at The University of Akron: School of Music and held the Theodor Dreiser Distinguished Research/Creativity Award at Indiana State University School of Music. He is co-author of "Theory for Today's Musician" with Ralph Turek, published by Routledge Francis & Taylor, NYC? His career as a conductor included serving on the conducting staff of the Cleveland Chamber Symphony, four seasons as Music Director of the Interlochen Festival Orchestra, Interlochen, Michigan, as well as conducting the University of Akron Symphony Orchestra and the Terre Haute Symphony Youth Orchestra. McCarthy, a dedicated martial artist, was promoted to 3rd Degree Black Belt in Chun Ma Tae Kwon Do in May 2012. A student of Grand Master Jeon Gyeong Ho, Akron, Ohio, he pursued additional studies in Asian Weapons, American Kenpo, and Chin Na Kung Fu with Grand Master Sifu James Adkins in Traverse City, Michigan. Byron Stripling is a jazz trumpeter who has been a member of the Count Basie Orchestra. ↑ "Sam Pilafian, Tuba Maestro of Multiple Genres, Dies at 69". ↑ "List of Pilafian's Classical Music Recordings". ↑ "Entry in the Internet Broadway Database for Sam Pilafian".